In PowerPoint for Office 365 or PowerPoint 2019, you can insert an online video from YouTube or Vimeo on a slide. The video plays directly from the website, and it has the site's controls for playing, pausing, volume, and so on. The PowerPoint playback features (Fade, Bookmark, Trim, and so on) don't apply to online videos. Because the video is stored on a web site, rather than in your presentation, you must be connected to the internet in order for the video to play successfully. In your web browser, locate the video you want. Copy the URL of the web page from the Address bar of your browser. Switch back to PowerPoint and select the slide where you want to place the video. On the Insert tab of the ribbon, select Video > Online Video. 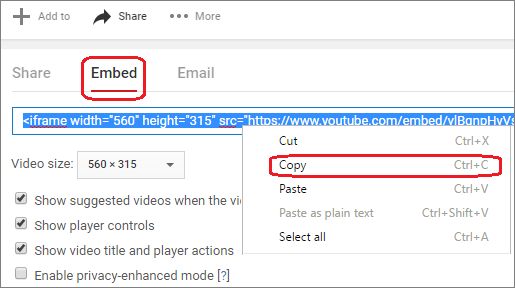 In the Online Video dialog box, paste the URL you copied in step 2. If a video is inserted successfully, you can play it either in Normal view or Slide Show. A Play button appears on the video in Normal view. In Slide Show, you can interact with videos just as you would in a web browser. By default, videos from YouTube and Vimeo play in "click sequence." You can play the video without having to click the Play button. Just tap the spacebar to advance to the next step in your click sequence. Not all online videos from these sites are allowed to be embedded. You should check on the video site to find out if a certain video can be embedded. For the purpose of playing videos in PowerPoint, Internet Explorer 11 is required to be on your computer. You don't have to use it to browse the web; you simply have to have it installed, because under the covers, PowerPoint needs its technology to play videos on Windows. If your operating system is Windows 10, then you already have Internet Explorer 11 installed. If you have an older version of Windows, you can go to this Internet Explorer Downloads page for instructions. Want to insert a video from your computer instead? See Insert and play a video file from your computer for all the details. In PowerPoint 2016, you can insert an online video with an embed code or search for a video by name. Then you can play it during your presentation. On YouTube or Vimeo, find the video that you want to insert. Right-click the iFrame embed code, and click Copy. In PowerPoint, click the slide that you want to add a video to. In the From a Video Embed Code box, paste the embed code, and then click the arrow. A video rectangle is placed on your slide, which you can move and resize as you like. To preview your video on your slide, right-click the video rectangle, select Preview, and then click the Play button on the video. Note: If your video doesn’t embed correctly, double-check that you have installed the required Office updates. In the Search YouTube box, type the name of the video that you want to insert, and press Enter. Select the video from the search results, and click Insert. Note: If your video doesn’t insert correctly, double-check that you have installed the required Office updates. Once the video rectangle is on your slide, select it, right-click it and choose Preview. A Play button appears on the video. Click the video's Play button. Because the video is on a web site, rather than actually in your presentation, you must be connected to the internet in order for the video to play successfully. On a slide in PowerPoint, you can embed content from Slideshare.net, a sharing web site for presentations, infographics, and documents. On Slideshare.net, any content that can be embedded elsewhere has a Share button on it. That button opens a window where you can copy an embed code like an embed for a video. On Slideshare.net, find the content you want to embed. Select the Share button beneath the content frame. Sharing codes appear in the video frame. Select the box named Embed. All the text in the box becomes selected when you do this. Right-click the selected text and choose Copy. The text you've copied contains more information than you need, so it needs to be trimmed and re-copied. Paste the copied text into a text editor such as Word or Notepad. Select the portion of the text that begins with <iframe src ... and ends with </iframe>. Copy that text. That's the embed code you need for inserting the content into PowerPoint. In PowerPoint, go to the slide where you want to insert the content. On the toolbar ribbon, select the Insert tab, select Video, and then select Online Video. The Insert Video dialog box opens. Paste the embed code in the box named From a Video Embed Code, and then press Enter. It takes a moment for PowerPoint to absorb the content. When it has done so, a black box appears on your slide. To view the content, select the Slide Show button near the bottom-right corner of the PowerPoint window. In PowerPoint 2013, you can insert an online video, and then play it during your presentation. Note: To use this feature, you must be using the desktop version of PowerPoint 2013 and have installed the April, 2014, Office updates and be using IE 9 (MS12-037) or IE10 or later (recommended). You can view a complete list of requirements and supported formats. For details on these options, such as starting the video automatically or playing the video full-screen, see Set the 'Playback' options for a video in your presentation. Once the video rectangle is on your slide, select it, then select the Playback tab on the PowerPoint ribbon. At the left end of the Playback tab, select the Preview button. YouTube videos on PowerPoint 2010 have stopped working. YouTube recently discontinued support for the Adobe Flash Player, which PowerPoint 2010 uses behind the scenes to play a YouTube video embedded on a slide. Following are two ways to work around this problem. Click a section heading below to open it and see more details. You can upgrade from Office 2010 to a newer version that doesn't rely on Adobe Flash Player to play YouTube videos, and therefore doesn't have the same problem that PowerPoint 2010 now has. To make the upgrade beneficial, you need to be using a version of Windows that supports the version of Office that you've chosen. Office 2013 requires Windows 10, Windows 8.1, Windows 8, or Windows 7. Office 2016 requires Windows 10, Windows 8.1, Windows 8, or Windows 7 Service Pack 1. If you'd like to always have the latest version of Office, you can become an Office 365 subscriber. Click to try or buy and to compare a subscription versus a one-time purchase. This task won't be suitable for everyone; it's for do-it-yourselfers who are comfortable with installing and setting up software on their own. In PowerPoint for Office 365 for Mac or PowerPoint 2019 for Mac, you can insert an online video from YouTube or Vimeo on a slide. In PowerPoint for Office 365 for Mac, Insiders can also insert an online video from Microsoft Stream, a video service for enterprises—people in an organization can upload, view, and share videos with one another. This feature requires PowerPoint for Office 365 for Mac version 16.22 or later. Switch to PowerPoint and select the slide where you want to place the video. On the Insert tab of the ribbon, in the Media group at the right end, select Video. Then select Online Movie. In the dialog box, paste the URL you copied in step 2. The video is added to the slide. To preview the video, click the Play button that appears on top of video. macOS 10.12 (Sierra) or macOS 10.13.4 (High Sierra) and later. Switch to PowerPoint Online and select the slide where you want to place the video. On the Insert tab of the ribbon, in the Media group, select Online Video. The video is inserted on your slide. You can move the video by dragging with the mouse, and you can resize the video frame by selecting a corner and dragging. To play the video, you must run Slide Show. On the ribbon, switch to the View tab, and in the Start Slide Show group, select From Current Slide. Slide Show opens, and then you can click the play button to begin. For related information, see Play a video in PowerPoint Online. PowerPoint Online can't trim videos, and online videos can't be trimmed. If you have a video that you want to trim, you must save it to your computer, then insert it on your slide in a desktop version of PowerPoint. Why can’t I embed a video in PowerPoint?